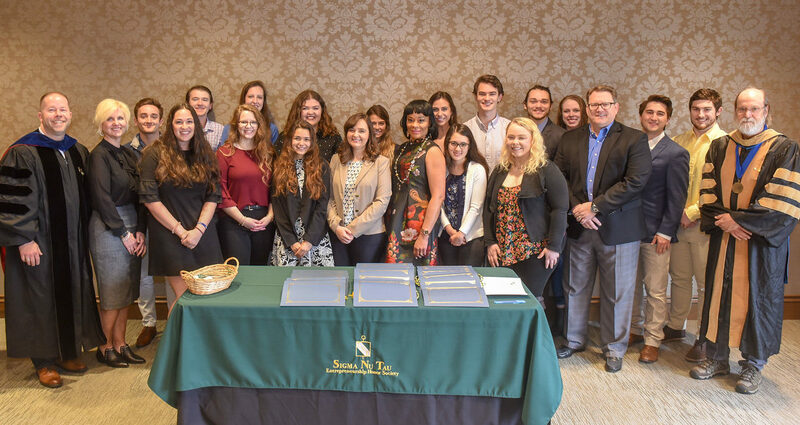 The Entrepreneurship honor society, Sigma Nu Tau, recently held its 2019 induction ceremony in which 29 new members were inducted. The new inductees include students, both graduate and undergraduate, as well as community members involved in entrepreneurship. Sigma Nu Tau was brought to Belmont’s campus in 2011 as the third chapter for the national honor society. Since then, more than 300 members have been inducted into this organization that focuses on encouraging academic entrepreneurship and the practice of principled entrepreneurship. In addition to the 24 students inducted, five community members were also honored at the ceremony. The honorary member inducted this year was Sean Hanson, founder of BUD Ministries, a ministry for college-aged men. Other community members inducted include Belmont Entrepreneur in Residence Victoria Kopyar and Sharon Reynolds, founder of DevMar Products, LLC that distributes environmentally friendly commercial cleaning products. Two Massey Graduate School of Business alumni were also inducted. Chris Taylor received his MBA from Belmont and is an investor in JumpStart Holdings and a franchisee owner of MassageEnvy. An alumna who also received her MBA from Belmont, Sarah Hadsor Worley, was also inducted. Worley is the founder, co-owner and operator of Nashville fan favorite Biscuit Love restaurant.